In our continuing series of UNO Hockey recruit profiles, we look at a talented forward who currently plays at a storied hockey prep school in Minnesota. 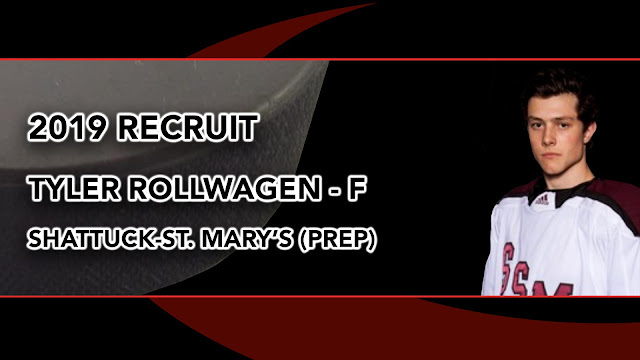 Shattuck-St. Mary’s forward Tyler Rollwagen (class of 2019) announced his commitment to UNO on Twitter Feb. 6, 2019. Rollwagen is currently the second-highest point producer on his Shattuck-St. Mary’s Boys Prep Team with 57 points (14 goals, 43 assists in 39 games). Rollwagen was ranked 51st on Cox’s list of prospects born in 2001. I know a number of UNO Hockey fans are relatively new to the world of college hockey and might not be familiar with Shattuck-St. Mary’s School in Faribault, Minn., but current Mav Jordan Klehr played for Shattuck-St. Mary’s. It is a prep school that has produced a number of high-profile hockey players including NHL-ers Sidney Crosby, Jonathan Toews, and Zach Parise. Details are scarce (as of this writing) as to when Rollwagen might join the Mavericks. Elite Prospects has him listed for next season, but it’s possible he’ll play a season of junior hockey. That said, Jordan Klehr joined UNO the season after graduating from Shattuck-St. Mary’s, so it is possible we’ll see him in a UNO uniform next season. Stay tuned. UPDATE: According to Heisenberg's recruiting database, Rollwagen is a 2021 recruit (thank you to C.A. Boehm for finding that). According to College Hockey, Inc. Rollwagen will arrive in 2020. And, according to Elite Prospects, he'll join the Mavs in 2019. Regardless of when we finally see Rollwagen in the lineup, I’m excited to see what he can do on the team. A point producer — who can make things happen and dish the puck where it needs to be — is something UNO will be in desperate need of with the departure of Mason Morelli and Freddy Olofsson. Rollwagen sounds like a smart/skilled player, and has the potential to become a key component in UNO’s arsenal over the course of the next few seasons.